Having a well-stocked pantry is the key to making many meals on the spur of the moment. 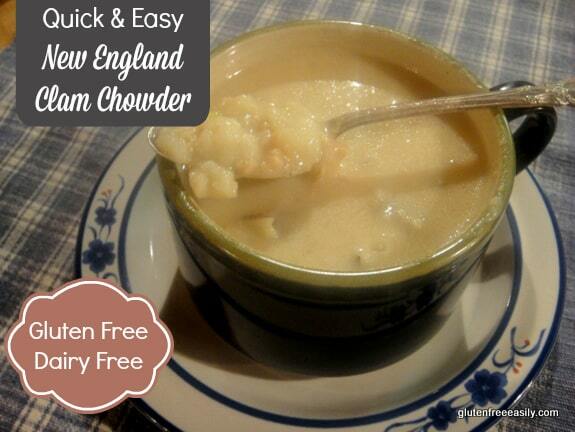 Have a craving for a certain dish, like the Quick and Easy Gluten-Free New England Clam Chowder shown? Or want to experiment? A well-stocked pantry can allow you to satisfy both needs without a special trip to the grocery store or specialty store. So, not surprisingly, the well-stocked pantry can also save you money and time. By pantry, I mean more than one’s dry storage, but also the freezer and the refrigerator. I try to keep all well stocked with gfe staples. I’m going to address this topic more in 2011 as I revisit the whole gfe approach, but I wanted to show you how my pantry served me well when I suddenly wanted clam chowder the other night. As all of you gluten-free readers know, clam chowder is not something we can enjoy out very often. Usually, a “gluten-full” flour is added to the recipe or a gluten-containing broth is used to make the chowder. I love clam chowder, and really chowders of any kind, so that’s always a disappointment to me. Because of lack of training of servers and cross-contamination issues, one has to be very leery of establishments that serve even gluten-free chowder. Here’s one example of how gluten-free clam chowder can become gluten full. Wendy (Celiacs in the House), Diane (The W.H.O.L.E. Gang), and I watched servers touching the soup ladles to bread bowls as they served chowder at a restaurant at Pike Place Market in Seattle. It only took one such occurrence for the entire bowl of chowder to be contaminated and unsafe for those of us who eat gluten free. So I decided to make my own New England Clam Chowder, and I came up with a wonderfully easy way to have thick, creamy version in just a few minutes! This gluten-free clam chowder didn’t taste like a soup that had been made in only a few minutes though; it tasted like it had been cooking and thickening—and frankly, “becoming soup”— for hours. That’s important because I’ve actually made seafood chowder before using popular chef’s recipes and even after cooking the soup for a much longer time, it still had that “new,” “not soup yet” taste without the creamy, thick consistency I desired. New England Clam Chowder is by definition a potato-based soup. The Baked Potato Soup here at gfe is a favorite of our family and our friends, so I decided to just adapt that recipe to be my gluten-free New England Clam Chowder. It was incredibly easy to do and the resulting chowder was a hit with us. Like I said, my pantry came through for me. In my dry goods pantry, I had canned clams, russet potatoes, yellow onions, canned coconut milk (full fat), and my all-purpose gluten-free flour mix. In my refrigerator, I had almond milk, butter, minced garlic, and bouillon. In my spice cabinet, I had seasoning salt and Old Bay Seasoning. They were exactly the ingredients needed to make a rich and hearty gluten-free New England Clam Chowder. Enjoy! If you've been waiting for a good clam chowder recipe that you can make at home, here you go! Make this Quick and Easy Gluten-Free Clam Chowder either with dairy or dairy-free ingredients as you wish. It's delicious either way! Microwave the potatoes about 8-9 minutes or until baked through. While potatoes are baking, drain clams and reserve juice in a 2-cup measuring cup. Set clams aside. In large sauce pan, melt butter and add onion over medium to medium-high heat, stirring occasionally until onions are translucent and cooked most of the way through. Cook about 7 to 8 minutes. While onions are cooking, fill a teapot/saucepan half way full with water and bring to a boil. Add garlic to your soup pan. Cook for about 30 seconds, stirring while cooking. Add flour. Stir to make a roux. (It doesn’t take long at all.) Remove from heat so roux will not burn. Add boiling water to measuring cup that already contains reserved clam juice, filling to 2-cup level. Stir in 1 ½ tsp soup base/bouillon granules. 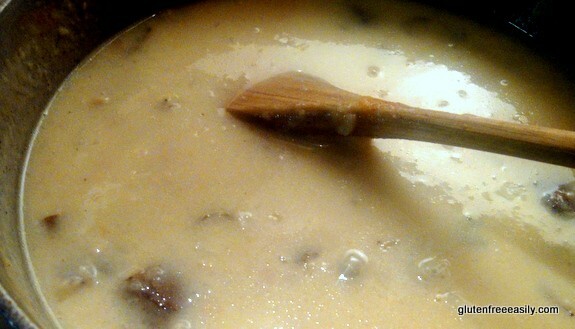 Stir well until soup base/granules are dissolved and becomes clam broth. Slowly add milk and broth to soup pan and return to heat. Scoop most of the pulp from one potato, mash it slightly and add to chowder. Bring chowder to a boil. Add seasoning salt and Old Bay (if used). Quickly dice the remaining two potatoes and completely empty skin of the third potato. Add to chowder and heat through for a minute or two. Serve. Enjoy. I recommend that you use chicken bouillon/granules, replacing the water in the recipe with clam juice and adding the gluten-free, dairy-free chicken bouillon/granules. Even with minced clams, I use my kitchen shears to cut all of the clam pieces very small. (I really don't care for chunks of super chewy clams.) 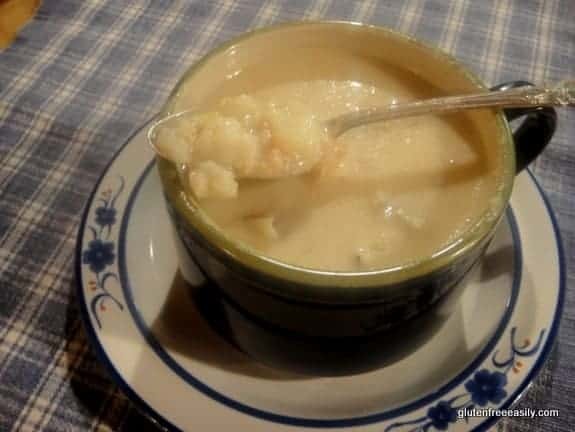 More potatoes will make this chowder thicker, but note that if there is any chowder leftover, it will thicken considerably upon cooling and additional liquid may need to be added before serving. I leave the skins on the potatoes for the extra nourishment they provide. They cook down most of the way and are pretty tender, so we enjoy them in our soups, but if you prefer, you can discard potato skins. 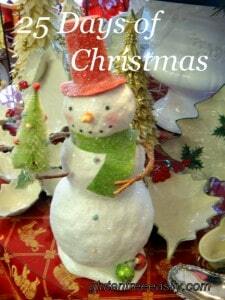 The 25 Days of Christmas event is winding down (and quickly! ), be sure to check out previous posts to make sure you haven’t missed any … especially the current cookbook giveaway! Originally published December 23, 2010; updated January 21, 2019. I loved those coconut muffins you made! The well-stocked pantry really widens one’s horizons, doesn’t it? Oh, I totally get what you are saying on the texture of the clams. I actually tried blending mine once … not a pretty picture … they all stuck to the blade! LOL, but no kidding. Using my kitchen shears worked much better. Another option would be just to put the clams in cheesecloth and get the flavor and then discard the clams after cooking. Why not? Whatever works, right? Lovely soup! Yes, I imagine it is rather quick if one can use canned clams – I am only able to get fresh ones and so the cleaning, steaming, and shelling of the clams is definitely a little bit of added work/time! Hey Zoe–Thanks so much! You can whip up clam chowder easily … bet you’ll love having your own simmering. 😉 I’ll look forward to your variation, dear. Shirley, coming from San Francisco, I am a clam chowder addict! I love your recipe!! I have not had chowder in ages because we are always so leery to eat it at a restaurant and I have yet to attempt my own version. Now I just may try it out!!! And I am all about a well-stocked pantry. You should have seen my mother’s while growing up. She always taught me that a well-stocked pantry lent to inspiration and motivation. Now I see how true that is! I really, really want to meet your mom! I just know I’d love her. 🙂 Looking in a full pantry is like opening up the big box of Crayola crayons … so many possibilities! And, when the pantry gets low on supplies, even that can be fun. Some of my most creative and fun recipes come from when I’m down to very little. I like a challenge, and usually I find it’s not even that much of a challenge. Always a delightful surprise either way! Delicious!! I made this last night! 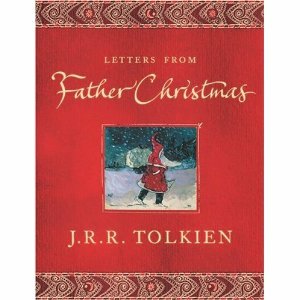 My hubby and I loved it. We’re from outside Baltimore and think the base would be an awesome GFCF version of Cream of Crab Soup. 🙂 Thank you so much!! I haven’t had a creamy chowder in over two years, since I was diagnosed to allergies to wheat (avoiding all gluten) and dairy. Please… keep up the great work!!! LOve it Shirley! I am working on this recipe (different version) for my next book. I think dairy-free clam chowder surprises people – it really is good! Hey Alisa–Thanks so much! I actually posted this recipe at New Year’s when everyone was so busy and I updated the title the other night so that folks looking for gf/df clam chowder could find it and because of the update it went back out in the feed. I can never figure out why or why not that it happens. Doesn’t always. Anyway, yes, this gf/df chowder is just lovely. It’s sort of like we’ve always said about gluten, the recipe just doesn’t need it. One clever reader, Annie, suggested replacing the clams with crab and I can’t wait to try that next! She already tried the chowder recipe and loved it. So happy that you’ll have a version in your next book. Can’t wait for that! Shirley, this looks so very easy! My husband loves clam chowder. Definitely going to have to make this! Hey Alta–Somehow I missed replying to your comment before … rats. We found this to be a great and super easy clam chowder. 🙂 Hope you enjoy if if you give it a try! This just showed up in my inbox. Even my emails arriving are behind. This looks like something Scott would slurp up with joy. I’ll have to get cracking on this one. I’m sorry to say I can’t serve it on Super Bowl Sunday as my Pats are not playing. But we’ll give it a try on any of these stupid cold snowy days. Thanks for figuring this out! Hey dear Diane!–As I was just saying to Alisa, I updated the title to contain gf/df so folks could easily find the recipe and the post went back out in the feed again. Probably a good thing since folks were pretty busy at New Year’s and might have missed this one. I think you all will love it and as reader, Annie, suggested, you can even replace the clams with crab and have another heavenly soup! You know you bring up a good point about people being so busy during the holidays. I think I’ll do a post in case people missed those. You’re so smart! I love the idea of crab in here too! Oh and I’m working on that menu already. Need to get some more folks to come over and eat all the food I’ll be making. Rule is they have to love football. I’m not chit chatting in the kitchen while the game is on, I’m watching every second. It’s the last game until next year. Diane–Always happy to give you ideas to implement! 🙂 I knew you’d like the idea of a crab version, too. Loving you Hawaii posts, Lexie! Oh my gosh, I don’t know how you keep from visiting there super often. Your family’s property is just so beautiful! Stunning, actually. Clam Chowder is not something I’ve ever seen on a menu over here before, and I don’t think we could get clam stock! We do have lots of Asian style seafood soups, and they’re delicous. Hi Monika–Welcome to gfe! 🙂 I was shocked to visit Better than Bouillon’s site and see “whey” in the ingredients for the clam base. I don’t know if the formulation has changed since I’ve made it or what the deal is. 🙁 But yes, you could leave it out or substitute organic chicken base and add some more of the canned clams to ensure you get a rich flavor. I’m so sorry about this misinformation. I greatly appreciate the heads up and will modify the recipe accordingly! I love chowders !! So thrilled to find a df recipe that doesn’t use soy milk as I can’t tolerate the latter. This may taste a little like those thai seafood soups I love!!! Thanks for using coconut milk!! How many servings does this make? Can it be frozen? How long can it stay in the fridge ? Hi Tazmin–It looks like you are new here at gfe–welcome! 🙂 No, I can’t do the soy milk either. I wince when I see it in products or recipes. Seriously. I do hope this chowder meets your expectations. 😉 I’m guessing 6 servings. I’m also guessing that it would freeze okay, but would need some stirring due to separation when heating and before serving. But that’s a guess as I haven’t frozen it yet. In the fridge, I’d keep it 3 to 4 days. You might find that you don’t have to worry about that though as you’ll want to eat it for every meal until it’s gone. I did. Just made this for the second time using a homemade vegetarian seafood broth (when I boil shrimp for salad, I retain the broth and add veggie scraps). It is delicious. I add minced celery and make my own “Old Bay.” My husband, who is a “real regular guy,” also can’t tell there is no milk or cream in it. Thank you for a wonderful meal!